I’ve just recently written a full Dealspotr review here. 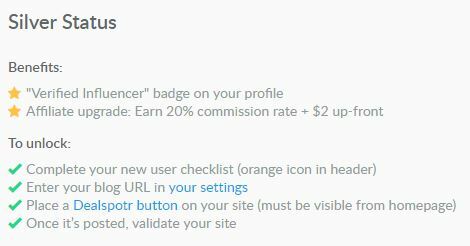 But I wanted to dedicate an entire post to how you can become an “influencer,” on Dealspotr – because they’re are some really great advantages! If you didn’t already know, Dealspotr is a site where you can earn points for sharing and editing deals/discounts on the website, as well as referring others to Dealspotr and interacting with the community. “Influencers” have some additional perks and privileges – which I will go into below. What Is A DealSpotr Influencer? Dealspotr partner with bloggers and social influencers to help grow their business. 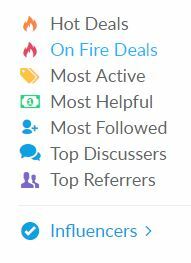 or other topics that may fit in well with Dealspotr, then you could sign up as an influencer and gain extra perks. There are so many types of blogs that can relate to Dealspotr too- (who doesn’t like finding a good coupon code or discount?!). You get the picture, the possibilities are pretty endless there. So, your blog doesn’t specifically need to be about saving or making money to blog about Dealspotr. As an influencer, you will get greater opportunities to earn points and you achieve different perks depending on what level you reach. If you have a blog or website, just sign up through this link to Dealspotr to claim your first bonus $5. You can then contact me directly for your bonus influencer code – I will give further details at the end of this post. If you’re already signed up, that’s ok too – I will also show you what to do at the end of this post. So, there are three different influencer levels: Bronze, Silver and Gold and I will run through each of these now. At the Bronze level, you get included into a directory of other Dealspotr influencers, which can be viewed by all members and this could lead to more visitors finding your blog. More exposure in the blogging world is always a good thing, so this in itself is a good opportunity. There are different leaderboards that you could compete in as well – the higher you up on any leaderboard, the more chance people will find you. You can also get a $5 access code for your own readers, so they will immediately benefit from signing up under you. When you qualify for silver status, you will get a “verified influencer,” badge on your profile. You will now be able to earn 20% commissions on anyone you bring to Dealspotr and $2 PER REFERRAL upfront. To qualify, you need to follow a few steps including: adding your blog or site URL and adding a Dealspotr button to your website. Finally, there is the gold status. With gold status, you can achieve a double (2x) lifetime points multiplier, you can cash out via paypal and you can earn 35,000 points, ($35) for writing an article on your blog relating to Dealspotr. To reach this level, there are other tasks required too – such as you need to post or validate your first 5 deals. While you can only earn amazon giftcards at every other level, once you reach gold status – you can withdraw via paypal. The great thing about writing a Dealspotr post on your blog is, not only will you get paid for it, they will also promote your review – which then will lead to extra free and often highly targeted traffic. But What If You Don’t Have A Website? If you’re thinking that being an influencer sounds pretty awesome – but you don’t have a website or blog yet – I have a post showing how you can literally set up a great looking site in a matter of seconds here: How to create a free website today. If you’re wondering what your blog could be about, but wanted to promote Dealspotr, there are various sites that could work really well for it. For example, money saving, frugal living, a site that reviews ways that you can save money online – a large number of free-to-join sites actually pay a commission if you bring people into the business. Or, you can earn referral commissions often by signing other people up and earning a percentage of their earnings. While this may not add up to much with one or two sites, it starts to add up when you get referral commissions from multiple sources. If you’d like to learn exactly how all this could be achieved – check out this program first. It’s free to get started and there’s a bunch of great people over there too. 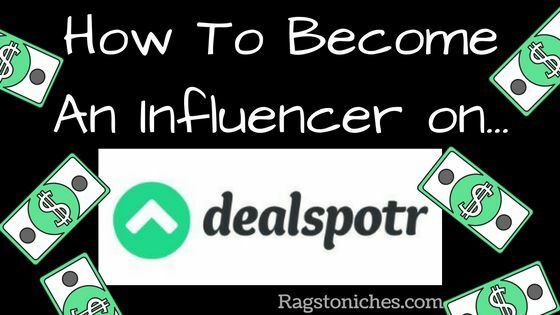 In order to become an influencer at Dealspotr, you first need an account. In order to be upgraded to an influencer, you need to do one of three things. Comment below and ask for one, I will email the code to you. Contact me here and ask for one. After you sign up to Dealspotr, you can contact me via message on there. I am @RagstoN on Dealspotr. After you’ve received your unique code, you need to sign up at one of two places. If you haven’t yet registered any account, take the code I have given you and go here! If you ALREADY have a Dealspotr account and just want to upgrade it, take the code I gave you and go here instead. That just about covers all you need to know about becoming a Dealspotr influencer, if you have any questions – leave me a comment below and I will get right back to you. Making money online for beginners. Ways to make $100 a day online. How to start a website on a budget. I had never heard of Dealspotr before this post. As soon as I leave this comment I am going to check it out. I like the idea of them promoting a post I have written. How and where do they promote my posts? I can see how it would benefit both of us to have a post about them promoted. You say commissions may not be much but I have learned online and in life generally speaking that having a little money coming from many sources is better than having a lot of money coming from one place. How long does it take to complete the actions that move you up through the ranks? I am looking forward to giving this a shot. See you there. they promote your post via their social media channels and you’ll also be visible on their site as an influencer, as will be your review. The whole process can be as quick as you like – once I decided to do it, I got to gold status very quickly. The barrier for me initially was posting the first 5 deals – as I wasn’t sure what to do. Once I got advice on that front, it was easy and I was able to do it very quickly. I’d say you could do it in a matter of days. Good morning Nat, Excellent article, I would like to obtain a code for Dealspotr, I read the whole article and I am interested in becoming an influencer, I would appreciate you sending me a code to become Influencer in Dealspotr, like the one you mention in your article, I already have my account in Dealspotr, I would like to upgrade to Influencer, thank you in advance. Hi many thanks, I will message the code – just be aware that you do need a minimum of 1000 visitors per month to your blog to become an influencer. If you can meet that criteria, then you can be an influencer. I have now messaged you the code. All the best! This is the first time that I hear of Dealspotr. Now I’am checking it out. I like that they will promote your posts. However, I would be more interested to know how to they promote them and where do they promote them. It would benefit me to promote my post about them. Even that commissions are not going to be very high, as you stated, I would like to be involved in this opportunity. I will definitely try this opportunity. Thank you for sharing. they post your blog post via their social media channels – which have thousands of followers. They also place a link to your blog post on their website, which can also be reached by many people. If you’re a the the level that you can become an influencer, it doesn’t take much time at all to move in the ranks. I’ve been too busy with other things to commit to this myself now, but I know it’s been worthwhile for other bloggers.